Wingo was a wanderer by nature. In tales of his childhood he recalled staying in the jungle until night fall, only brought back to his village by the enticing thought of his mother huddled over the fire preparing food. Wingo gives me some perspective in the primary rainforest. As I sat in Mishualli’s tiny town square the evening before my amazon trek, my nerves built. I batted away evening mosquitos with a distracted gesture. What lie waiting in that dense jungle I’d heard so much about? The next day a pallid dawn crept into a smoky haze above the stock-still waters of the tributary. Only the sharp crackling of the canoe’s engine broke the tension as it lurched away from the small town’s banks. After a few hours, a slippery exit came into view. As I scrambled upwards, Wingo took immediate control. He glanced wistfully skywards and I acknowledged that despite this being such an alien landscape for me, for him, this was home. I found a steady walking rhythm and a few hours later I was in primary forest. 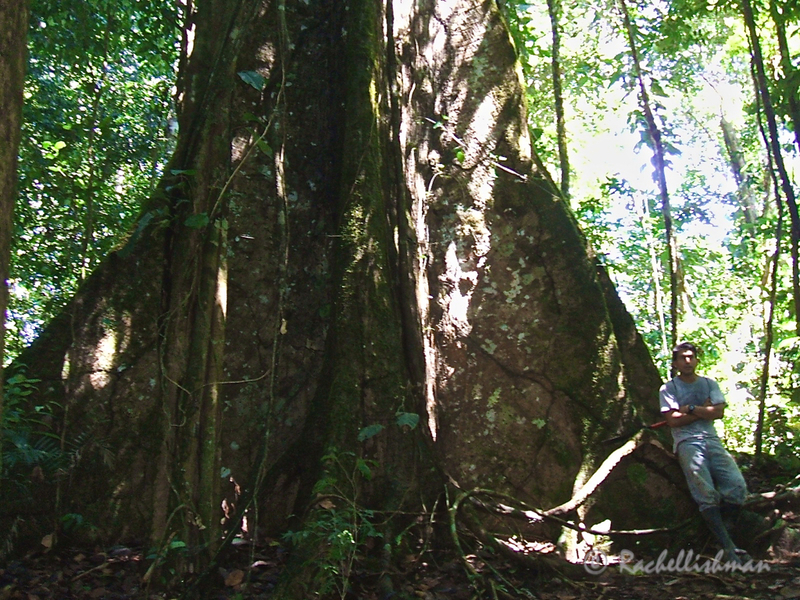 The trees were so large that their exposed roots towered over me. The humidity was stifling. Sweat stung my eyes but it didn’t detract from the kaleidoscope of flora and fauna that unfolded around each corner: See-through frogs as tiny as a toenail, leaves far wider than my head and the calls of birds and monkeys whooping in the canopy. Underfoot, magnificent insects scuttled to safety. “Stop!” Wingo’s voice interrupted my sensory overload with a sharp warning. His hand aloft, he gestured to pass him quietly and quickly. Snapping a leaf from its stem he began snatching rhythmically at a nearby bush. He frowned realising I’d paused to watch him. “Keep moving! Tropical wasps’ nest!” At exactly 3pm, it rained. Not the lack-luster Welsh drizzle I was accustomed to, but heavy raindrops that bulleted through the thick canopy and drenched everything below. The clay soil belched under my weight as I trudged into camp. 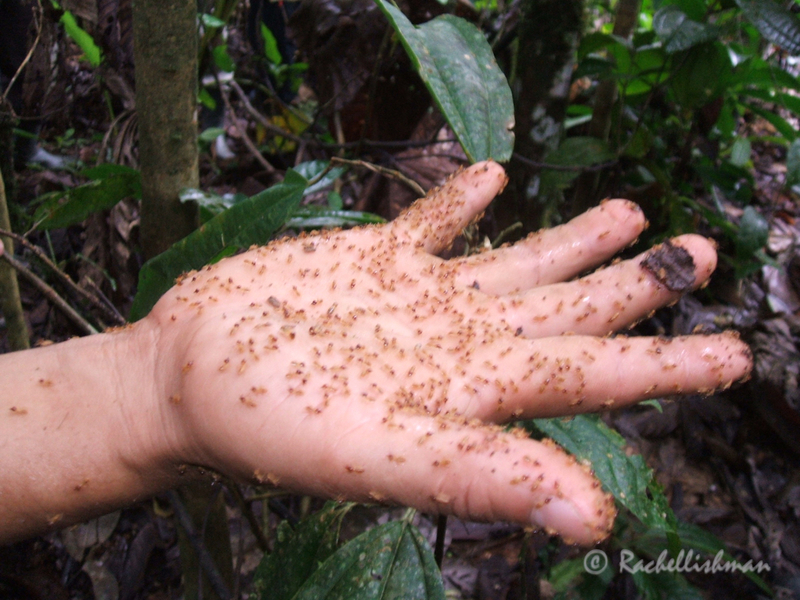 Wingo sticks his hand into a termites nest…to show me its inner workings! However, the real excitement in the jungle begins after dark. When my eyes failed, my ears took over and the throb of the green awning became almost deafening. Wingo once again led us into a canoe and rowed into the middle of the river. “Turn off please”, he asked, pointing at our head torches. I was overwhelmed by the noise spewing from the pitch-black forest. Nature ruled supreme here. Back on land, I was exhausted but Wingo wasn’t quite ready for sleep. I marched behind him towards a derelict wooden barn, fiddling anxiously with my torch. My eyes roved around the space gradually adjusting and in an abandoned corner, rested on a small bundle of twigs. Wingo pointed upwards. A colossal white candyfloss spider’s next hung from the rafters above me. My heart raced as I swung around to see the twigs had gone, but he looked calm as he put his arm to the ground. Slowly and stealthily, an enormous spider climbed onto his shoulders. Wingo smiled playfully. We hadn’t encountered the tarantula he’d hoped for, but instead found the slightly less poisonous Scorpion Spider. As it made its way across his cheerful face I recoiled and was reminded once again of the very different lives we had led up until that day. Yet there we were, at midnight, in the amazon rainforest, sharing a moment that I’ll never forget. Eeeeek, what a huge spider! haha that was my thought exactly! 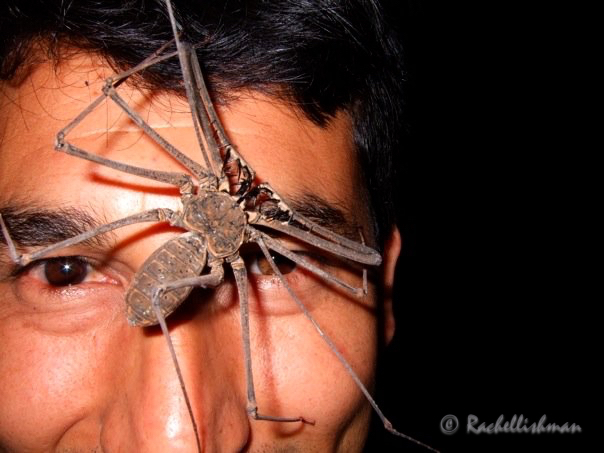 I don’t mind spiders too much but even then, you would never get that thing on my face! Oh gosh! I’d really have to battle a lot of fear in that situation, haha. The whole experience was quite surreal Leah – mostly because Wingo was so very calm about it! We decided after that, that it was better to sleep with no torches in our hut as there were some amazing insects marching around the place! Oh my word that spider is enormous!! I know he must be used to things like that but I would freak out if anything half the size of that came within a meter of me, let alone crawled across my face! And you can see he is smiling underneath that giant thing! He was very pleased with himself! The crazy thing is (and I’ve never actually looked up whether this is true or Wingo was just having me on) apparently they are poisonous and a bite from them would be a nasty few days in hospital! He confirmed however that they can’t kill you – I wasn’t comforted by that!! Wingo was the perfect guide, knowledgeable and definitely comfortable with the spider. What a unique introduction to the Amazon. He was comfortable with every single living thing Lynne – from wasps to termites and the bigger creatures… making me feel like a colossal wimp! Oh my god this Wingo it totally crazy! hehe…. If someone put that big spider in my face I would just die from shock!! Enjoyed reading, he kind of reminded me a bit of our crazy guide when we travelled into the Amazon about 10 years ago. Thanks for stopping by! I know Wingo was definitely one of a kind….I haven’t met any guide that quite compares!